I bought a Groupon deal for a dozen cupcakes (for $12!!) 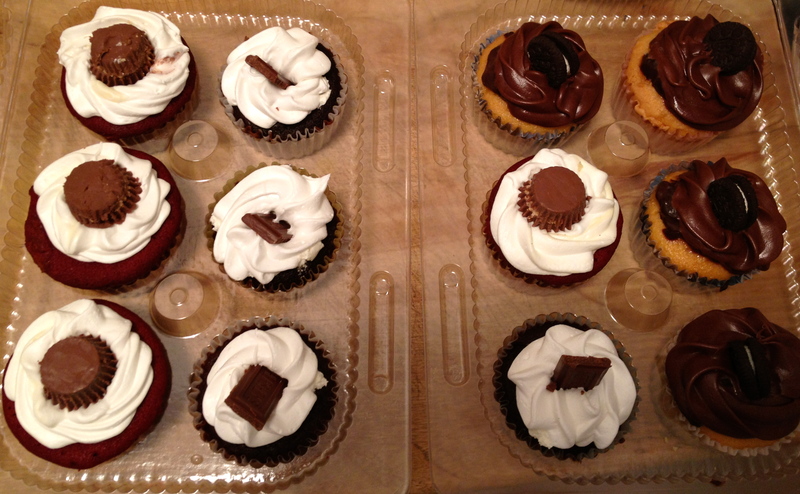 to be delivered from Cupcake Heaven NY and was excited to find out that we could mix and match any 3 flavor combos. After browsing their website, Gabriel and I placed an order for: 1. red velvet cake. vanilla icing. peanut butter cups on top.2. rich chocolate cake. whipped cream filling. marshmallow icing.hershey bar topping.3. classic white cake. chocolate pudding filling. chocolate icing.oreos topping. The order arrived for us a few days later in cute little boxes, but we were bummed to find out that the combos were incorrect, and included some flavors that we really strongly dislike and wouldn’t eat. At that point, I emailed the company to point out this disappointment and was told that our order would be corrected and re-delivered at our convenience. Happy to accept that mistakes are made, and a solution was offered, I placed the new order for a couple of weeks later. Well, the order arrived today and I must say that I am VERY pleased. Everything we wanted was exactly correct, and the cupcakes were totally delicious. The cake was moist and fresh- I’m guessing they came out of the oven just an hour or 2 before they arrived at my door. I read the reviews on Yelp and see that a lot of people are unhappy with this company. Let’s give them the benefit of the doubt. They are clearly new and working out some kinks. Bear with them for a little while and I’m sure they will be a great success. Nom nom nom. YUM.